The last few years have been transformational for climate diplomacy. In 2015, we witnessed the first legally-binding global climate deal with the Paris Agreement, and last year’s COP22 conference saw governments and businesses reaffirm their commitments to sustainable growth. These events, coupled with a groundswell of public pressure, leave no doubt that working toward a low-carbon economy is, and will remain, a priority. Now, in the midst of dramatically changing global political climates, the private sector has an even greater responsibility and opportunity to take the lead in advancing critical social and environmental agendas. With the world population projected to increase by more than 1 billion people by 2030, every company will be challenged to meet ever-increasing demands amidst resource constraints while also reducing environmental impacts. This has huge implications for the transportation industry in particular, which already represents nearly a quarter of Europe's greenhouse gas emissions. However, the opportunity is there as businesses are uniquely equipped to deliver innovative solutions on a large scale, develop best practices, influence demand and supply chains, and build capacity toward sweeping progress. In order to adequately address our industry’s impacts, businesses need to continue to invest in new technologies targeted at improving efficiencies. From electric and hydrogen-powered vehicles to 3D-printed auto manufacturing platforms, I have witnessed an increasing number of sustainable innovations in transportation. One of the biggest breakthroughs aiding this proliferation is the big data revolution, which is driving efficiencies. Big data delivers big results, not only by providing companies with a wealth of information, but also by helping businesses make real-time decisions to improve operations. While companies like Uber and Lyft are changing the landscape of passenger transportation by using data to advance ridesharing that cuts down on transportation costs and traffic congestion, the shipping industry is also realizing similar benefits. For example, apps like Roadie can now match shippers with drivers who are headed in the same direction as the delivery address. Similarly, Coyote Logistics, crunches pricing, lane information, service metrics, and capacity to recommend the best shipping solutions to customers, eliminating empty miles and reducing carbon emissions. We are seeing big data being used as part of a broader effort to capitalize on information and predictive models to increase efficiencies, thereby reducing both costs and environmental impacts. We created UPS ORION (On-Road Integrated Optimization and Navigation) – a route-optimization system, developed over 10 years, that analyzes real-time information from every package, along with customer information and detailed maps, to sort through trillions of possible choices and create the most efficient daily route for our drivers. By developing more efficient routes, we are able to maximize the utilization of delivery vehicles and drivers, resulting in significant fuel savings -- which, in turn, cuts about 100,000 metric tons of greenhouse gas emissions from our operations every year. Over the years, I have seen the challenges to investing in innovative technology firsthand. Often the upfront costs of new technologies are significant and deter small businesses from investing in them, despite the fact that initial costs will, in many cases, be paid off in future operation savings. Another barrier is that of regulations hindering the use of alternative fuels. The adoption of renewable natural gas in the European transportation sector is slow due to a number of government incentives encouraging its use in other industries in preference to transport. To combat these hurdles, the private sector must continue to work closely with government to bring down costs, reduce inhibiting policies and regulations and help scale new technologies. Despite these challenges, I strongly believe the key to continuous, industry-changing innovation is companies working together to share best practices and key learnings. My advice for other businesses working to implement and scale green technologies is three-fold: be focused, be committed and be patient. First, be clear about your intention and rationale behind pursuing sustainable technology: Why are you doing this, and what will be the short- and long-term impacts on your business? Once ambitions are clearly defined, you must lay out an achievable, long-term roadmap to make progress toward your company’s commitments. You will need buy-in, not just from the top of the organization, but also from employees at all levels and key stakeholders outside your organization to ensure stamina and commitment when you come up against challenges. And lastly, you will need to remain dedicated to building new technologies up to scale. With economic forces and the political environment constantly changing, investment and infrastructure development can be unpredictable. An important step in ensuring buy-in remains strong over the years is measuring and reporting progress to gather insights that can help improve and support these commitments. Ultimately, investing in technologies that increase the sustainability of operations is a smart business move. It serves as a combination of risk mitigation and opportunity creation. And, if you are able to demonstrate strong leadership, tangible brand benefits including increased cost savings, enhanced customer engagement and higher employee retention rates will follow. Our world needs more companies that are committed to being at the forefront of technology investments that spur sustainable outcomes, and who work with other leaders to use innovation as a tool for addressing critical environmental challenges. 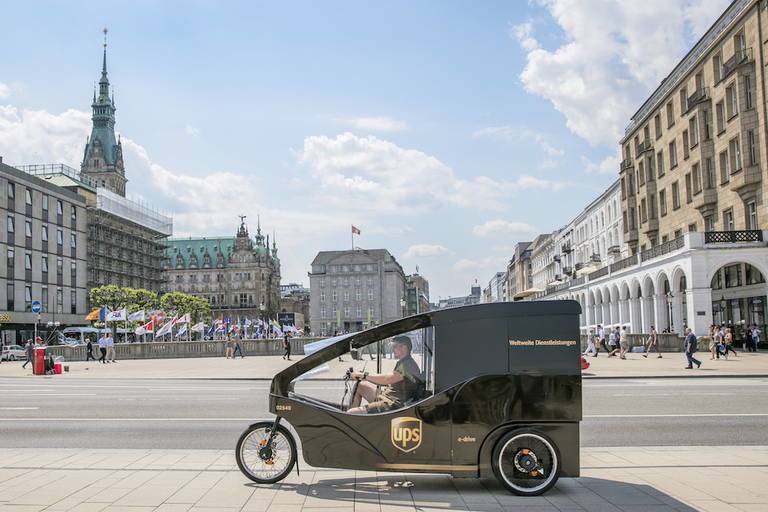 Peter Harris serves as UPS Director of Sustainability in Europe.